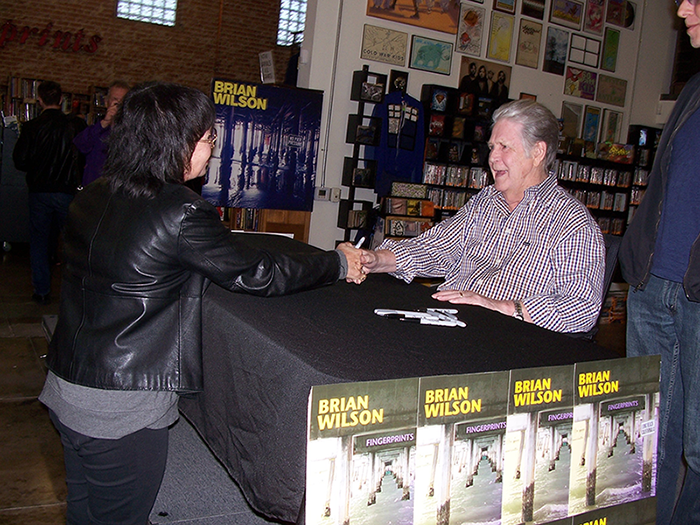 Brian Wilson greeting an admirer at Fingerprints Records. Photos by Matt Cohn. 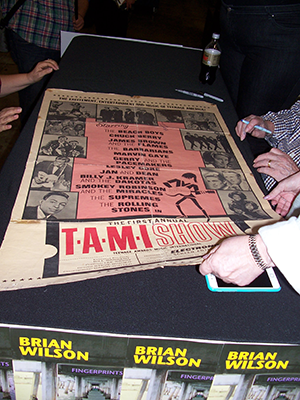 Below, left: Wilson preparing to sign an original T.A.M.I Show poster from 1964. For ninety minutes, a Capitol Records representative kept the line moving briskly as Wilson patiently and cheerfully greeted fans from age 7 to 70. Fingerprints inventory specialist Frank Hayler smartly chose to play selections by Wilson’s childhood vocal-harmony influence the Four Freshmen over the store speakers, which created a relaxing and nostalgic atmosphere. Wilson, the prolific driving force behind the Beach Boys’ legendary success, has been working hard promoting “No Pier Pressure,” which includes collaborations with new artists such as country singer Kacey Musgraves and fun. front-man Nate Ruess as well as Wilson’s old buddy and Beach Boys bandmate Al Jardine. 53 years after tracking the first Beach Boys cut, “Surfin,’ ” Wilson is still creating his signature soaring, airy harmonies, with a wistful tinge that comes from a life of remarkable ups and downs. Wilson was accompanied last night by his 18-year-old daughter Daria, who took the “No Pier Pressure” cover photo under the Santa Monica Pier, and by his wife Melinda, whom he married in 1995. “I think he’s always surprised by the fan reaction,” said Melinda as her husband signed copies of “No Pier Pressure,” “Pet Sounds,” vintage 45 sleeves and a stunning, original T.A.M.I. Show poster from the 1964 Santa Monica Civic concert which featured the Beach Boys along with James Brown, the Supremes, Chuck Berry, Marvin Gaye, the Rolling Stones, and other ’60s legends. “He’s only been at it again since 1998, so it’s not like he was constantly out there meeting the fans,” Melinda said. The in-store appearance by Brian Wilson was yet another coup for Fingerprints owner Rand Foster, whose very first record purchases were two Beach Boys albums. Foster has landed in-stores by the Foo Fighters, Weezer, fun., Chrissy Hynde and many others, but he refuses to pat himself on the back. “If anyone deserves respect tonight it’s Brian Wilson for coming in and giving everyone an amazing moment after giving us a lifetime of amazing music,” said Foster. 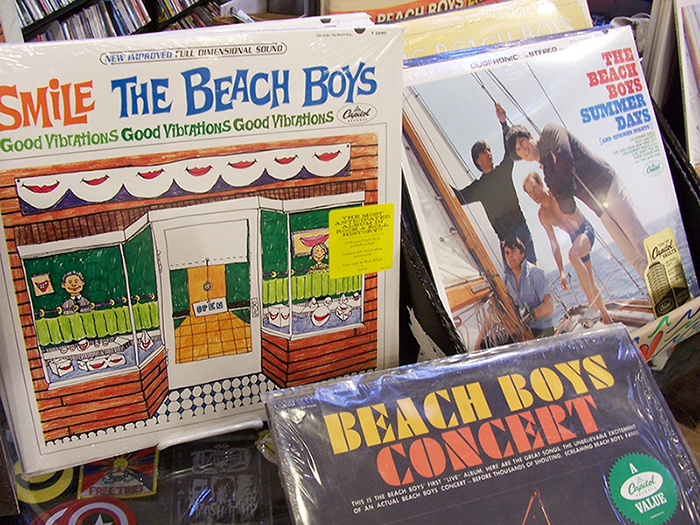 Vintage Beach Boys vinyl on display at Fingerprints.